Kwoyelo was the first person to be indicted before the International Crimes Division (‘ICD’), a special division of the High Court created in 2008, in furtherance of the Ugandan government’s commitment to realize the provisions of the Juba Agreement on Accountability and Reconciliation. In July 2011, he was arraigned on charges of 12 grave breaches of the fourth Geneva Convention (incorporated in domestic law through the Ugandan Geneva Conventions Act of 1964) and 53 alternative counts of penal code violations such as murder, kidnapping, and aggravated robbery, allegedly committed between 1996-2009. For a fascinating account of the trial’s commencement, read Mark Kersten’s personal observations over at Justice in Conflict. 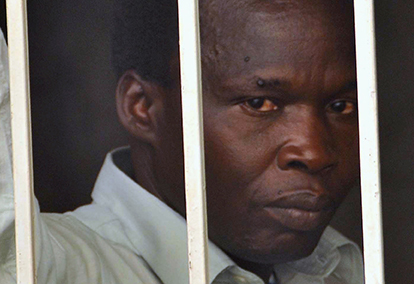 Before the actual trial began, his defence counsel submitted that the case be referred to the Constitutional Court, arguing that Kwoyelo was entitled to amnesty under the Amnesty Act 2000, which offers amnesty to anyone who ‘renounces rebellion.’ Over 26,000 people have been granted amnesty since its inception, with almost 14,000 of them being ex-LRA combatants – some of them a lot more senior than Kwoyelo. In November 2011, the Constitutional Court ruled in Kwoyelo’s favour, holding that he was entitled to amnesty and should be released. 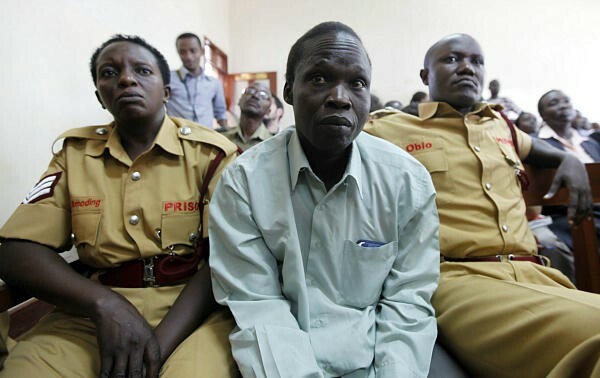 However, the authorities refused to release him, even after Kwoyelo obtained a further order of mandamus from the High Court in January 2012, compelling the Amnesty Commission (the state body charged with implementing the amnesty policy) to grant the amnesty certificate and for the Director of Public Prosecutions (‘DPP’) to release him from prison. These orders were subsequently stayed by the Supreme Court to allow the DPP to appeal the ruling to the Supreme Court itself. Thus, since April 2012, Kwoyelo has been sitting in Luzira Prison in Kampala, awaiting resolution of his case. What contributed to the delay was the fact that the bench of Supreme Court was not adequately constituted, in that it did not have the requisite quorum of seven judges to hear constitutional matters. In the meantime, Kwoyelo’s lawyers lodged a petition to the African Commission on Human and Peoples’ Rights (‘ACHPR’), asking for it to rule on the illegality of his continued detention. But the ACHPR, faced with its own immense backlog, has yet to rule on the merits of the petition. However, the quorum issue was subsequently resolved in June 2013, when new judges were appointed to the Ugandan Supreme Court, making it fully constituted. Sources in Kampala inform me that the DPP was about to request the case be scheduled for hearing during the last constitutional appeals session in November 2013, but Kwoyelo’s defence were not in a position to proceed. Then, a few days ago, as the year drew to a close, and in what appears to be his first-ever public interview, Kwoyelo made a surprising request to President Museveni to be pardoned. This request is peculiar for a number of reasons. Taking this into account, I don’t see how his lawyers could have reasonably advised him to make this request. Furthermore, given that the aforementioned administrative obstacles to hearing the case have now been removed, it seems unlikely. Equally, it is entirely plausible that Kwoyelo made this request of his own volition, without legal counsel, and simply gave a passing journalist some good copy. He may simply have asked to be freed, as he approaches 4 years in pre-trial detention. Or, perhaps he knows something we do not? President Museveni has issued pardons to political rivals in the past, notably to convicted former officials of the Obote regime. One particularly interesting comment from Kwoyelo’s interview reads: I am willing to work with the Government at all cost. Once considered for clemency, I swear never to go back to rebel activities.’ Reading this comment, one cannot help but think of Caesar Acellam. Kwoyelo is undoubtedly aware of the government’s treatment of Acellam, who was ‘arrested’ in May 2012 in the Central African Republic. (For an interesting account of his apprehension, see Scott Ross’ account over at JiC). Reputedly the LRA’s fourth-in-command at the time of his arrest, no criminal proceedings have been commenced against him. Instead, he and his family live under the ‘protection of the UPDF in military barracks in Gulu’. 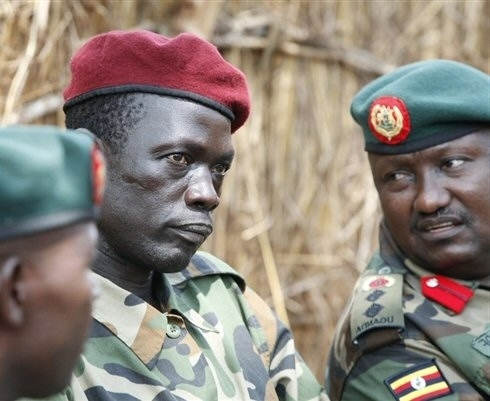 He is reportedly assisting the UPDF as they continue to militarily pursue the LRA, in return for not being prosecuted. Should Kwoyelo’s case eventually be heard before the Supreme Court, it will be a truly fascinating hearing, the outcome of which will have serious repercussions, way beyond the immediate issue of Kwoyelo’s personal liberty. The DPP will contend that the provisions of the Amnesty Act should not apply to grave breaches of the Geneva Conventions, and that amnesty should not be granted for war crimes and crimes against humanity. If the Supreme Court agrees with that contention, that could effectively render 26,000 amnesty certificates legally null and void, leaving thousands open to potential prosecution, however unlikely that may be, both practically and politically. 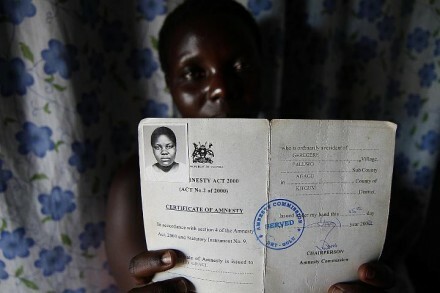 A ‘reporter’ holds up her certificate of amnesty. Photo: The Vancouver Sun. What would be more damaging, especially in terms of the wider human and social side-effects of such a ruling, would be the removal of the sense of personal security amnesty has given to those who were abducted, forced to commit egregious crimes and who returned on the back of a formal promise from the state that they would not be prosecuted. The policy of amnesty has undoubtedly contributed to large-scale defections from the LRA and help bring the conflict to an end. Others might argue that such policy considerations should come second to ensuring Uganda adheres to its obligations under international law and the Rome Statute. 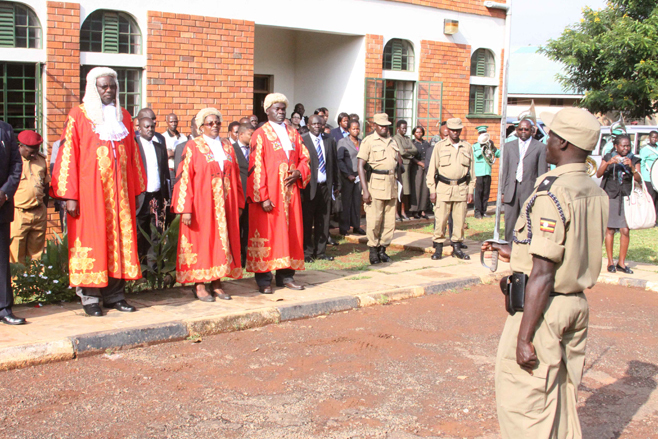 The Acholi people of northern Uganda await the outcome of this case with immense interest. While working there, I gave some lectures on Transitional Justice processes in places such as Gulu, Atiak, Amuru and Kitgum. Whenever I mentioned his name, the room fell completely silent, raptly listening to every word about this trial. Subsequent debate opened to the floor about the trial was incredibly engaging and at times, extremely heated. Some ex-combatants who have been granted amnesty see the treatment of Thomas Kwoyelo by the authorities, and the ultimate outcome of this case, as setting a very important benchmark for returnees and how the state perceives them. As Kwoyelo was himself abducted as a child into the LRA, some former abductees see this case as an extended prosecution of ‘them’ also. The ICD is intended to be a counter-setting to the ICC, and the government seems to be determined to make it a success. Or will the Supreme Court decide the fate of 26,000 people in one sitting? This entry was posted in Amnesty, Detention, International Criminal Court/ICC, International Justice, Kwoyelo, Peace vs. Justice, Reconciliation, Rights of the Accused, Transitional Justice, Uganda, Victims by Paul Bradfield. Bookmark the permalink.